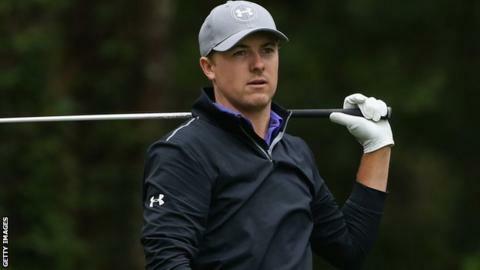 Jordan Spieth struggled on his first outing since winning the Masters as Northern Ireland's Graeme McDowell shared the lead after round one of the RBC Heritage in South Carolina. Spieth, world number two, claimed his first major at Augusta on Sunday, but shot a three-over-par round of 74. McDowell, 35, who last won at the French Open in July, shares the lead with American Matt Every on five under. Ian Poulter is three shots back, with Scotland's Martin Laird one over. Spieth - who has not missed a cut in seven tournaments - was the focus of much attention but the 21-year-old American damaged his hopes when he found water and went on to make a double bogey on the 14th. Asked how many interviews he had conducted in the run-up to the tournament, Spieth replied: "I've lost track. "Just getting to experience all these incredible things, whether it's a business interview, a sports interview, appearing on The David Letterman Show, meeting President Clinton - a lot took place and it's almost sad to leave. "I've got a good feeling about tomorrow. I feel I got some swings in, got in some rhythm and can at least go out and feel the shots. It was just an off day and it happens." McDowell, the 2010 US Open champion, had not shot better than 71 in 12 rounds but recorded six birdies, including one which followed a stunning iron shot to within three feet of the pin on the par-four 12th hole. "It was great to feel comfortable out there today, see my lines, hit my speeds and make a few putts," said McDowell, who has not won on the PGA Tour since taking this title in 2013.